Myrtle Beach is one of the great vacation destinations on the east coast. Families travel from all over to experience all that this great beach town has to offer. While most people want to spend time at the beach or at the pool, others need to find different things to do during their vacation. One of the great activities to try in Myrtle Beach is fishing. Fishing is great fun for people of all ages and the Grand Strand has a few different ways for you cast your line. Many locals prefer to simply fish from the beach. After hours when most vacationers leave the water, there will be a group of men and women who venture down to the ocean, set up their beach chairs, and cast their lines. People who are not content with just sitting on the beach find fishing to be a more meaningful way to pass the time. If you plan to fish from the beach you will need a fishing license. You can get a fishing license from places that sell fishing equipment like Bass Pro Shops or Wal-Mart. Those who wish to battle the high seas may want to try their hand on a fishing charter. Myrtle Beach fishing charters will take you out into the ocean to fish for tuna, tarpon, sharks and many other creatures of the sea. The bigger fish rarely come close enough to shore to catch from the beach so a chartered tour is the way to go for the big game. These tours usually include rods, reels, bait and tackle, and fishing licenses. Some even offer night tours where you can go out and fish specifically for sharks! Catching the big one could make your Myrtle Beach vacation one to remember. Another great place to go fishing is on a pier in Myrtle Beach. Fishing from a pier allows you the ease of fishing from the beach while putting you out in the water far enough to catch bigger fish like you may on a chartered tour. Most piers have bait and tackle shops where you can buy or rent equipment, buy bait, obtain a fishing pass and possibly get a few tips about the pier's hot spots. You typically don't need a license to fish from a pier since they offer a pass to those who just want to fish for a few hours. Try out a few of Myrtle Beach's piers and find out which one is luckiest for you! 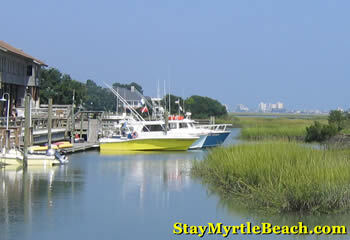 Fishing is a great past time and Myrtle Beach is a great place to take part in it. If you are planning to stay in Myrtle Beach, you should consider taking an afternoon (or night) to go fishing. No matter where you plan on fishing in Myrtle Beach, you are bound to have a worthwhile experience. If you're still looking for a place to stay, check out these oceanfront hotels and resorts in Myrtle Beach. 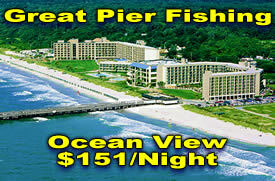 Many are conveniently located near some great Grand Strand fishing.